The RBA have now kept rates at 1.5% for the 26th consecutive month. Moreover, the market view is that we have a lot longer to go at this record low. The ASX Cash Rate futures indicator suggests Feb 2020 for the next move. This low rate environment has left many SMSF investors feeling the pinch on their income. The search for a higher yield, whilst keeping funds allocated to low risk profile investments has never been greater. Latest APRA and ATO data show Australian households have over $900 billion in bank deposits, SMSFs alone account for $157 billion. While more than 90% of this money is with the top 10 institutions, the lion’s share heads to Australia’s big 4 banks (over 80%). Many investors feel the only choice is to roll short-term Term Deposits – they take out a 3-month TD and roll it 5-6 times. Towards the end of each 3-month term, when the bank asks what they want to do, the only option seems to be “roll it”. While the intent is often to sort out an alternative ‘next time’, the likely case is that most investors haven’t. They know they want to ensure these funds remain low risk, but there seems to be no other choice. The end result is SMSFs are missing the opportunity to earn the higher rate that an 18-month TD would have paid. At the same time, the returns they receive with each roll are likely getting lower and lower. Are you parking your money in a TD, rather than making it work for you? This cycle offers a key opportunity. Most household money is in the shortest term TDs – 60% in 0-3 month TDs – that means up to $540bn is due to roll in the next 12 weeks. This means now may be the perfect time to look for that new opportunity. And the matter of trust? SMSFs can often achieve higher TD rates by looking outside of the top names, to ones they’re probably less familiar with. Making the choice to lock up money for longer periods can also provide higher returns. But, both of these approaches have key drawbacks. Is there the same level of comfort when investing with a less familiar bank? And what if you need earlier than planned access to funds due to unforeseen circumstances? Don’t forget with Term Deposits there are usually penalties if they money is withdrawn early. Recent research from Deloitte and Nielsen suggests the banking industry has experienced a significant decline in trust. As a result, more than 2 million Australians are considering their options. Generation X appeared to be the most impacted. Perhaps their needs for an array of financial products may be behind the feeling of paralysis. With many SMSF trustees being Gen Xers, the link between SMSFs and the desire for another alternative is clear to see. For those with more touchpoints with one organisation, the harder it can be to see where changes can be made. The research confirms this, it indicates that Gen Xers, and therefore SMSFs, have a dilemma. They have the greatest concerns, but in turn feel the most tied to their existing banking relationships. Corporate bonds provide predictable returns and have a similar pay-off profile as a TD. They provide a return of capital and set income payments along the way (subject to no default). Bond investors are effectively loaning money to top ASX-listed companies rather than a bank. They don’t have the government guarantee of TDs, but in exchange for the additional risk, the yield achieved is generally higher – up to 50% higher¹. Accessing corporate bond returns has never been easier. 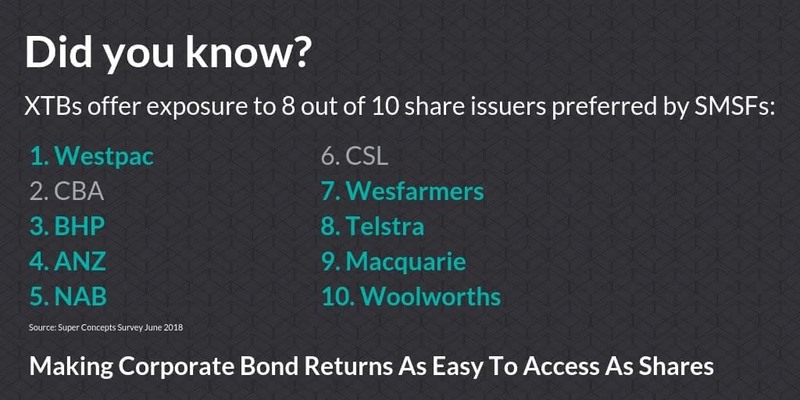 With a range of more than 50 individual corporate bond XTBs on ASX, SMSF investors can pick and choose from more than 25 ASX100 brands – names they know and trust. Add to this a growing range of bond ETFs, and you really have a broad range of solutions to choose from. Both XTBs and ETFs also come with the added benefit of trading on ASX, meaning you can say goodbye to the drawbacks of minimum investments and break fees. Simply buy and sell XTBs just like shares and benefit from ASX T+2 arrangements. This means quicker access to your money should you need it. Corporate bonds could make your money work harder and put you back in control. So when your next TD matures, you have the perfect opportunity to move your investment to a brand you trust AND get a better yield. This article was first published in SMSF Blueprint.